IT’S HERE IT’S HERE IT’S IT’S HERE! Starting off with a bank robbery/heist of some sort in New York City pulled off by some masked kids, it seems. Action scene — wow, this doesn’t really feel like Stranger Things yet. The girl in the getaway van uses her mind to cause some sort of bridge collapse… they get away. Punks with powers. Her nose starts bleeding, just like ELEVEN’s… her number, though, as seen on her arm, is 008. TITLES…. 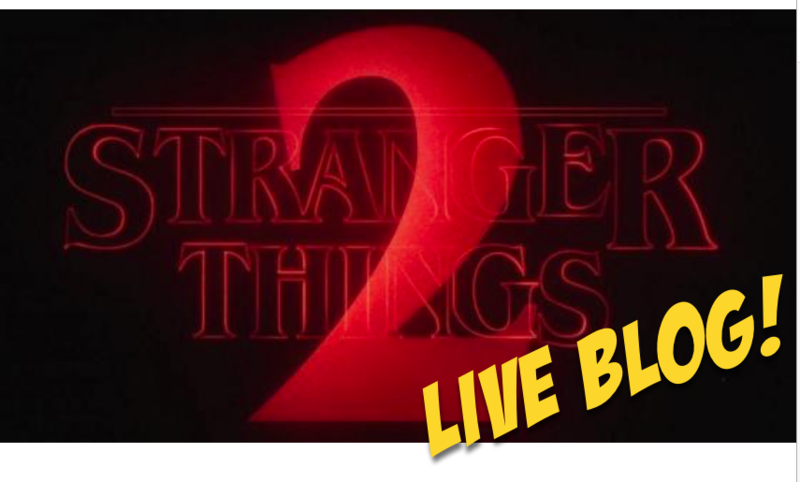 yes, Stranger Things is back….. staring Sean Astin and Paul Reiser! Very cool. Chapter One: Madmax. Cut to: Light up tombstones decorated for Halloween. Dustin calls Luke on giant walkie-talkies. 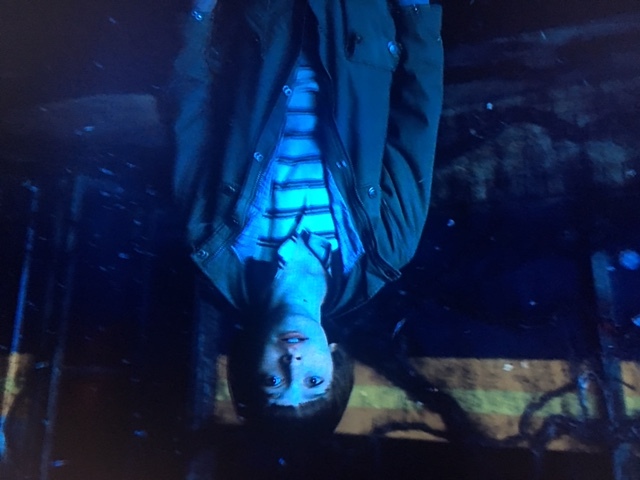 Mike sits in the tent once occupied by Eleven. Everything seems ridiculously frenetic and intense at this moment — as the kids ride off on their bikes to the arcade. THE ARCADE SCENE feels like it should have been the beginning part!!!! Not that stupid heist scene with characters we don’t know. I’m sure the heist scene will come back sometime later, but we don’t care about that—we care about our five kid protagonists, which brings us to…. Now it gets good — FINALLY!!! 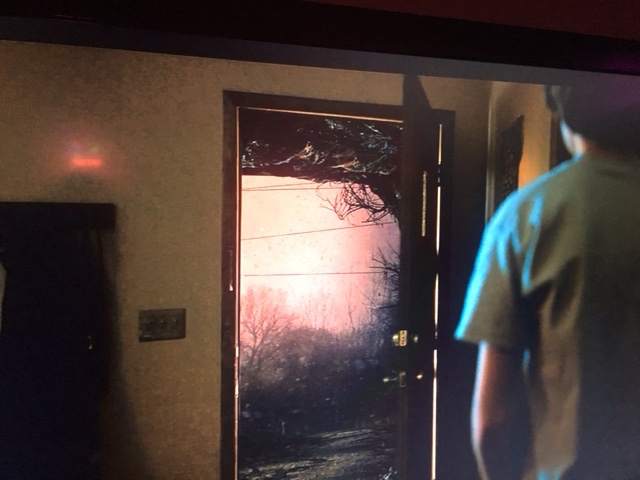 Will wanders outside during some weird vision of other-wordly vision of the sky/clouds lighting up…. THIS IS WHERE we should have placed that stupid opening heist scene….they could have paid homage to the Return of the Living Dead, with that whole punk-rock heist scene. Visions of the Upside Down! The Terminator is playing at the theater! Now, back to the police station…. officer JIM is having to deal with a weird conspiracy kook. Okay, back at high school…. close-up on another red-head…. DON’T TRY to replace Barb! The older kids are kissing, hooking up…. we’re sure they’ll break up soon, no one on TV likes a couple…. TV audiences like to see THE PURSUIT of couple-dom. Anyway, Steve and Nancy are making out in the car. Zzzzzzz. New girl = Max (Maxine), the new red-head. 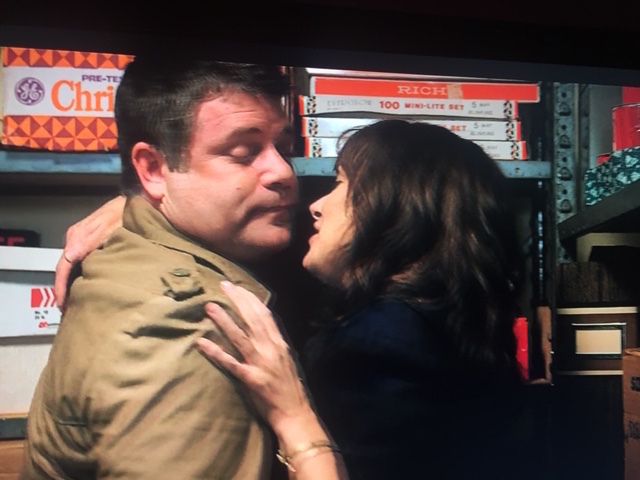 Sean Astin is making out with Winona Ryder…. what happened to her feelings for the police dude? Thought they were hitting it off…..ah, conflict, here we are. THIS would have been the perfect opportunity to throw in a GOONIES reference, just saying…. something about “you kiss much better now that you’re braces are off.” Ha! Okay, now we cut to an entire field of rotten pumpkins…. flies everywhere. Cop Jim investigates. Is this now a throwback to CHILDREN OF THE CORN? Cheap scare with the crow. Oh well. Might be interesting to pay homage to JAWS 2, where Chief Jim is paranoid and almost PST, hard to believe what happened last season. Let’s see where this goes. NOW we see Jonathan, the older brother of Will, coming into school. Talking and walking with Nancy… but interrupted by Steve, the douche-bag boyfriend. LOVE THE SYNTH music throughout…. hints that Nancy likes Jonathan. The boys chase after MADMAX, the new red-head of the season. And crazy mom Winona Ryder shows up to whisk Will off to….somewhere… maybe therapy? Chief Jim is there. Looks like a physical. This scene makes us feel AGAIN that the opening scene was weird. AND this should have been the first scene with Chief Jim. PAUL REISER shows up as the doctor!!!!! Where the heck has he been? This is some sort of neuroscience center with electrodes all over Will’s head. He’s telling the tale of seeing the weird vision outside the arcade. Will feels his vision is an omen of doom — it (whatever “it” is) wants to kill everyone. OH HOW WE’RE TIRED of Winona being frazzled…. c’mon! She’s more than a one-note actress…. 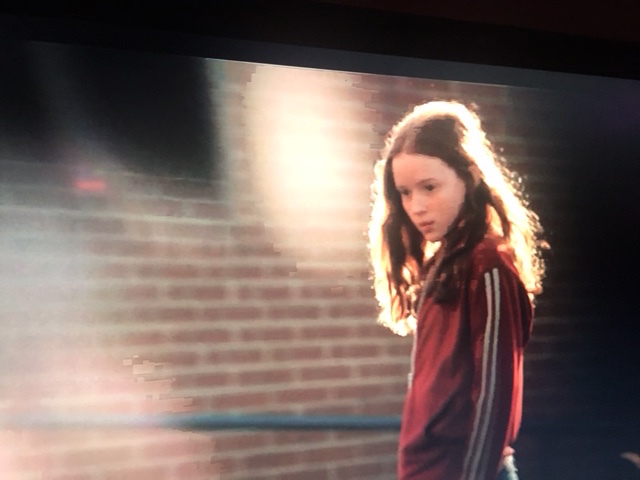 can’t we please give her a scene where she doesn’t act as if the sky is falling on her head. Smile once in a while, for crying out loud. Really getting tired of the constant “Oh my gosh, oh my gosh, oh my gosh” from her character. AND YES, we completely distrust Reiser’s doctor character….. especially since he goes into a secret underground bunker to witness some sort of tests with men in hazmat suits. The hazmat man kills some sort of larva monster with a fire-thrower. By the way, Dustin’s teeth have grown in. DINNER AT BARB’S HOUSE — her parents have hired a detective/reporter to find Barb…. 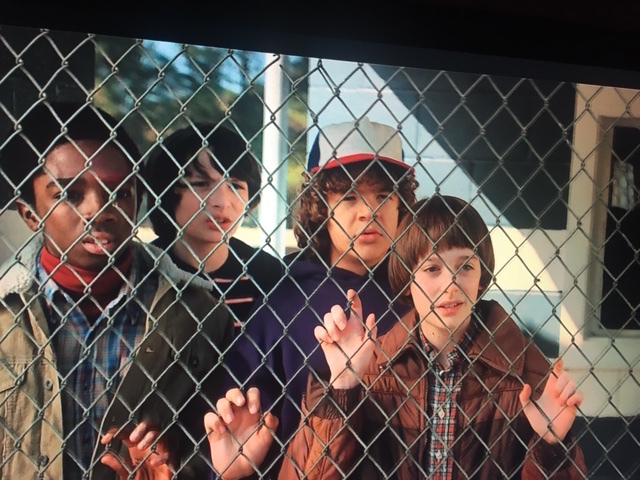 oh, poor folks…they have no idea their precious Barb (#JusticeForBarb) is gone for good, rotting away in the Upside Down. We FINALLY get to see Nancy weeping over the loss of her friend Barb…. THIS SCENE IS LONG OVERDUE!!!! Everyone loved Barb. The scene almost feels forced, as if the Duffer Bros were thinking, “Oops, we gotta do something for Barb.” Either way, glad to see some sadness for Barb. Mike has the BEST Millennium Falcon toy! The boys are out on their bikes at night….ah, the 80s, back when kids were safe to ride bikes with their friends at night. OH. MY. GOSH….. Winona Ryder is smiling as she cooks popcorn…..NO FREAKIN WAY…. Stranger things have happened…. glad to see this. The Brothers — Will and Jonathan — bond over the fact that they’re both freaks. Tender moment. Kinda cool. Sure with the acting was better on behalf of the older bro. Interrupted by a fat Sean Astin. Phone rings, for some reason Winona freak out…. (residue from last season). Best part of the episode? THE MUSIC!…and Eleven. And maybe even seeing Dragon Lair onscreen. Chief Jim seems to have put on some weight…. 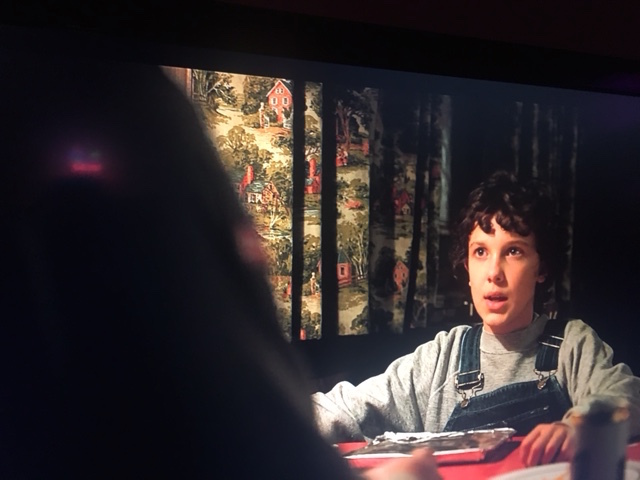 too many Eggos with Eleven, maybe? Will and his story with the visions. Dustin is taking a lead, out-shining the other characters. New Madmax character seems super interesting. All the red-haired characters introduced as an homage/tribute to Barb. Mike seems almost forgotten. Same with Lucas. Although nice to see Mike still longing for Eleven to be back. Lucas seems like just a background character almost. We can’t wait til the next episode, but it’s 2 a.m. and we gotta get to work in the morning, don’t we? (We’ll see). We did a super-short discussion of EPISODE ONE, both before and after… check us out! And here’s our AFTER-the-episode REVIEW.